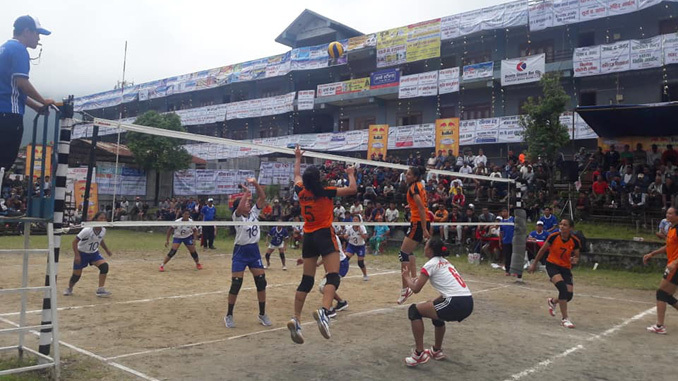 Pokhara—New Diamond Academy Kathmandu beat Tops School in a straight set of 25-22, 25-17 and 25-19 in a opening match of National Women’s Volleyball Tournament kicked off in a court of Indra Rajya Laxmi School, in Pokhara on Monday. Similarly, defending champion Armed Police Force thrashed Chitwan Tigers in a straight set of 25-21, 25-18 and 25-14. The tournament that ends on September 12 was inaugurated by Gandaki Province Social Development Minister Nardevi Pun. According to publicity committee coordinator Dharmasingh Bhandari, a total of 5 teams have taken part in the tournament. The winner team will bag Rs 100,000 and runner up will get Rs 65,000 including trophy and medal. Likewise, Tops Secondary School lifted the title of inter secondary school level volleyball tournament, beating Karuna Nidhi Foundation. The winner bagged Rs 25,000 while runner up Rs 15,000.